Over the course of the last season, Beth (Emily Kinney) has become one of the most interesting characters on The Walking Dead, growing from “Maggie’s little sister” into a fully realized person in her own right. At the end of “Coda,” however, that all comes to an end as she catches a bullet in the dome and dies. 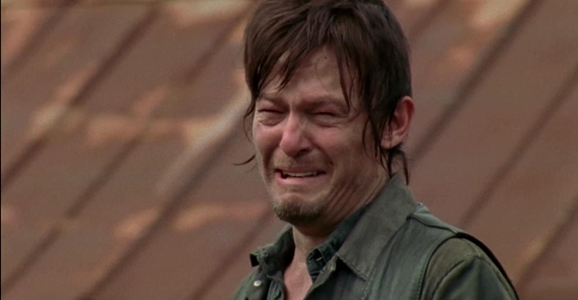 It’s a big emotional moment, especially for Daryl (Norman Reedus), with whom she formed a strong connection (it’s amazing how well you can bond with someone over booze and zombie killing), and obviously Maggie, who had just learned her kid sister was still alive. Like I said, this wasn’t entirely unexpected. The last few episodes made it abundantly clear that either Beth or Carol (Melissa McBride) was going out in the finale—we suspected it would be Carol, but not strongly enough that Beth’s death was much of a shock—but some fans were taken aback, and one in particular started a petition to bring Beth back. From the dead. There was so much more to be done with her character and they chose to kill her in a disgusting, unsatifying [sic] death that caused more anger and dissapointment [sic] than shock and mourning. Beth was a symbol of hope that a lot of women could relate to and see themselves in (especially self-harmers who saw her as someone who overcame their suicidal/depressive feelings). By sloppily killing her it just shows that she was used to further a man’s (Daryl’s) storyline. We realize that the circumstances she dies in are irreversible, but this is television. Anything is possible. Maybe it was all a dream, or an autistic kid looking into a snow globe. This does bring up a couple of good points. For a show that has primarily been a boys club, the last 16 episodes, since the middle of season 4, has seen the female characters, including Beth, Carol, Maggie, and Michonne, become the most interesting people on the show, and this derails that some. Another frequently cited problem with the series is the crushing bleakness and despondency, it can be such a stone cold bummer to watch. That’s another element that, over the same span, has gotten better. It’s not always much, but, Beth especially has managed to bring occasional rays of hope, which has been a refreshing change. Change.org is usually home to political, social, and human rights campaigns, but “Bring Beth Back!” already has almost 18,000 signatures. You have wonder how many, or if there’s even a number, it will take to make this happen. No worries. This petition will be ignored. If Beth IS brought back due to this petition, it would demonstrate a collapse in the integrity of the creative process that has brought us to where we are. Beth’s death was for a reason. As even stated in the petition, “Beth was a symbol of hope”. The first half of this season is exactly NOT about hope, or at best, about finding hope, being lifted by it, and then plummeting back to the depths when it is all mercilessly shattered by the reality of the world the characters live in. The obvious example was the revelation that Eugene’s quest to save the world was nothing but a self-serving scam. Beth’s death is another aspect to this. Nobody lives just because they are a symbol of hope, and nobody lives just because some viewers like them. If Beth comes back due to a petition , letter-writing campaign, or anything of the such, I will stop watching. My only gripe is that Daryl didn’t get to slowly take his revenge by lowering that harpy feet first into a vat of boiling sulferic acid. So damn sick of entitled “fans” of anything thinking they should have a say in how a story is told. Pick a fandom, any. There’s always that group that thinks the creator should cater to their desires. I would loooooooooove to see their reactions to the comic. Sure, we’ll file this next to the “Build the Death Star” petition. While Change.Org started with a noble idea, it’s devolving into a joke when used in such a manner. Beth lasted a lot longer here then in the comic. I was pretty shocked and dismayed when she died in the show, and I think it’s a loss to this cast, especially because a few lesser characters should have went first. But it happened, no going back. Have to move on.